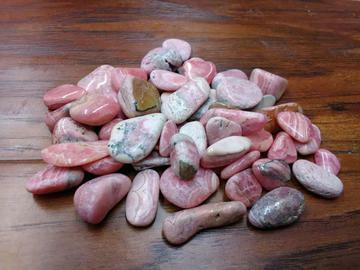 Rhodochrosite is a manganese carbonate mineral. In its pure form, it is typically a rose-red color, but impure specimens can be shades of pink to pale brown and it streaks white. It is mined in Romania and Argentina. Rhodochrosite energizes and cleanses the base, sacral and heart chakras. It is good for the digestion, the heart, the kidneys, spleen, pancreas, the pulse rate, and the thyroid.